“This production is the ‘poster child’ for what we’re trying to do here at 24th STreet Theatre,” explains executive director Jay McAdams. “It’s in-your-face, gritty, you’ll laugh and you’ll cry theater that will be appreciated as much by kids as by their parents. In fact, it’s so hip and cool that adults without kids won’t want to miss it either.” 24th STreet Theatre’s ambitious 15th Anniversary Season aims to “reinvent” theater for young audiences in L.A., offering sophisticated, provocative productions that parents might not recognize as typical family fare, but which can be shared and enjoyed by kids and adults alike. 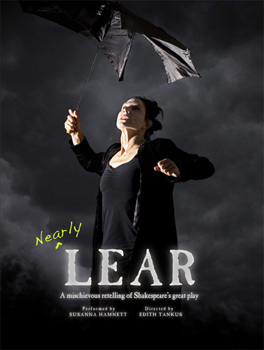 Nearly Lear, directed by Edith Tankus, Friday, Oct. 19 at 7:30 pm; Saturday, Oct. 20 at 2 pm & 7:30 pm; and Sunday, Oct. 21 at 2 pm. Tickets are $15 for adults; $10 for kids under 16; $12 for students, seniors and teachers; and 24 cents for residents of the theater’s surrounding North University Park neighborhood. 24th STreet Theatre is located at 1117 West 24th St., Los Angeles, CA 90007 (at the intersection of 24th and Hoover). Secure parking is available for $5 in the lot on the southeast corner of 24th and Hoover, and street parking is also available. For reservations and information, call (213) 745-6516 or go to www.24thstreet.org.